عرض السلة “الساعة الذكية FITMAKER” تم إضافته إلى سلة مشترياتك. Stay connected in style with the 2015 42mm Apple Watch Sport, which comes with a rose gold anodized aluminum chassis and a stone fluoroelastomer Sport band. Designed for users looking for the next generation of connectivity, Apple’s Watch moves your iPhone’s apps and functions to your wrist so you can do more while leaving your phone in your pocket. Apple Watch Sport connects to your iPhone via Bluetooth 4.0 and displays notifications, apps, and more on its 1.5″ display. It can also connect directly to the Internet thanks to 802.11b/g/n Wi-Fi. The internal battery lasts for up to 18 hours of normal use and is recharged with an included inductive magnetic charger. The Activity app displays progress made towards your daily activity goals with three intuitive rings that grow the more you move, finally closing when you hit your targets. The Stand ring shows how often you’ve stood up to take a break from sitting, the Move ring shows how many active calories you’ve burned, and the Exercise ring shows how many minutes of brisk activity you’ve completed. 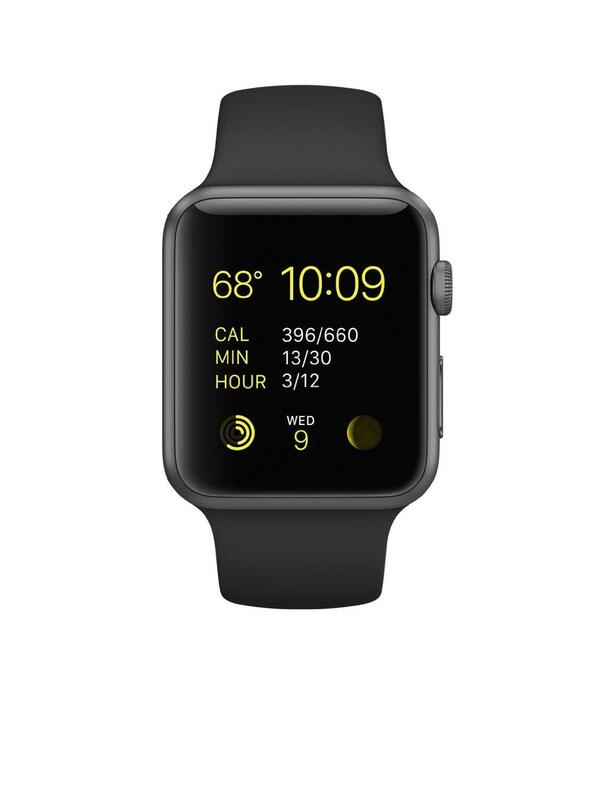 Swipe up from the bottom of the Watch to view active calories burned, steps taken, and distance traveled. Apple Pay is a secure mobile payment method that lets you pay for goods and services online and in-person without reaching for your wallet. You can add credit cards and rewards cards to Apple Pay, which does not store card numbers on your device or share them with merchants. To pay with your Apple Watch, simply double-click the side button and hold the display of Apple Watch up to the contactless reader. A gentle tap and beep confirm that your payment information was sent. Check your heart rate at any time with the Apple Watch’s built-in heart rate monitor. It uses an array of LEDs and sensors to photoplethysmographically determine how hard your heart is working. Every ten minutes it attempts to take a reading, which is then stored in the Health app. Certain conditions, such as movement, extreme temperatures, and tattoos can interfere with readings. Apple Watch senses how much pressure you use when you tap on its face, adding a new dimension to the ways you can interact with it. Press firmly to see additional controls, change watch faces, and more. Instead of a vibration, the Apple Watch ‘taps’ on your wrist to alert you to new notifications and respond to inputs. It gives different types of taps in different situations, so you can feel the difference between a call and a text message without looking. 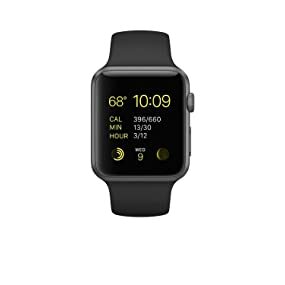 Place your Apple Watch on its side and connect the included magnetic charger to activate Nightstand mode, which displays the time, date, and alarm when you touch the screen, digital crown, or side button. When your alarm sounds, press the Digital Crown to snooze or the side button to turn it off altogether. Activating your Apple Watch requires your iCloud Apple ID and password, so your information will stay safe even if your Watch is lost or stolen.